Map Indicates Billions Of Human Lives Targeted For Extinction! Does This Map Show The Planned Destruction Of 90% Of The World's Population? Map Indicates 6.5 Billion Lives Targeted For Extinction! The eye-opening map seen above was emailed to ANP from our reader 'Proud' who painstakingly put it together showing Deagel.com's population forecast for the year 2024 in colors broken down into countries forecast to lose more than 20% of their population in less than 8 years compared to the countries forecast to gain at least 5% of their current population. The countries shown in white did not have a noticeable enough change to their population to chart. As you can see, the large majority of the countries forecast to lose 20% or more of their population by 2024, represented in two shades of red, are in the Northern hemisphere with the exception of Australia and New Zealand, and as Proud points out, the majority of them surround the Northern Atlantic Ocean basin. In contrast, the large majority of those being forecast to gain population by 2024 are in the Southern hemisphere. In this story we explore several different theories for what the Deagel map seen above might mean and as Proud mentions, bringing this information to the attention of others will hopefully open it up for further discussion. We're all ears here at ANP and would love to read your ideas in the comment section below. And if enough and 'the right' people are asking questions, maybe we can get some more solid information from Deagel on what these numbers really mean. Another startling fact that immediately emerges from this map is that nearly all of the countries shown in red are countries from Western civilizations. Does this map forecast the end of Western civilization as has long been warned? Some of the population numbers we see forecast for 2024 are absolutely startling and appear to show either a 'Biblical event', 'intentional population destruction' or Western nations gone sterile. In 2015, the population for the US was 321 million people. The 2024 forecast for the US is 59 million. In 2015, the population for Puerto Rico was 3.6 million people. The 2024 forecast population for Puerto Rico is 942,000. In 2015, the population for the UK was 64 million people. The 2024 forecast population for the UK is 20 million. In 2015, the population for France was 67 million people. The 2024 forecast population for France is 46 million. In 2015, the population for Italy was 62 million people. The 2024 forecast population for Italy is 67 million. In 2015, the population for Germany was 81 million people. The 2024 forecast population for Germany is 41 million. In 2015, the population for Ireland was 4.9 million people. The 2024 forecast population for Ireland is 1.5 million. In 2015, the population for Greece was 11 million people. The 2024 forecast population for Greece is 5 million. In 2015, the population for Sweden was 9.8 million people. The 2024 forecast population for is 6 million. In 2015, the population for Austria was 8.7 million people. The 2024 forecast population for Austria is 5.9 million. In 2015, the population for Canada was 35 million people. The 2024 forecast population for Canada is 26 million. In 2015, the population for Switzerland was 8.1 million people. The 2024 forecast population for Switzerland is 4.4 million. In 2015, the population for Iceland was 333,918 people. The 2024 forecast population for Iceland is 172,202. In 2015, the population for Australia was 23 million people. The 2024 forecast population for Australia is 12 million. In 2015, the population for Israel was 8.1 million. The 2024 forecast population for Israel is 3 million. In 2015, the population of New Zealand was 4.4 million. The 2024 forecast population for New Zealand is 3.3 million. For those who haven't been following our previous Deagel stories on ANP, the sources of Deagel's information reads like a 'who's who' of the 'deep state' and the 'new world order' and includes the CIA, US Department of Defense, US Department of State, the World Bank and the European Union. What might they know that we don't know? 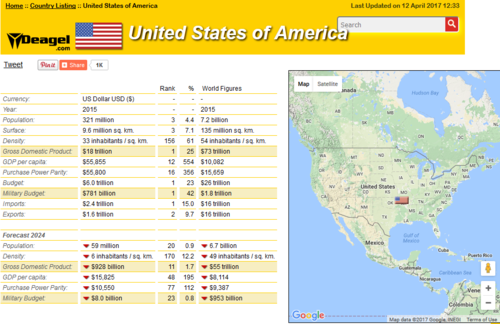 As we reported on ANP back on March 24th, the information on Deagel also shows us an America in total collapse by 2024 with a Gross Domestic Product of $928 billion (compared to $18 TRILLION in 2015! ), a GDP per capita of $15,825 (compared to GDP per cap of $55,800 in 2015) and a military budget of $8 billion (compared to $781 billion in 2015). How might America change so drastically in such a short period of time, less than 8 years from now? The fact that nearly every nation shown in red has long been considered part of 'Western civilization' is troubling. As has been long warned, Western civilization is falling which is apparently exactly what the Islamo-fascist-globalists want. From Turkey's President Recep Erdogan calling for the overthrow of Europe by Muslims having 5 children each to Turkey's foreign minister warning religious wars will be starting soon in Europe, we see that Europe has nearly fallen - can America be far behind? The final video below takes a look at the 'fall of Europe'. 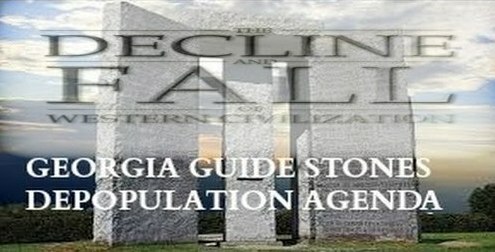 Are we looking at the Georgia Guidestones depopulation agenda in red? The fact that the '1st goal' on the Georgia Guidestones is 'maintaining the world's population under 500 million people while in 2017, the global population was approximately 7.5 billion shows nearly 7 billion lives may still be 'targeted for extinction'. It was somewhat confusing. I began to realize that, some areas were affected differently right next to each other due to topography, and delineating between biblical and SUPER biblical seemed pointless. Well, there was a devastating pattern. As you can see, something horrific is predicted in the north Atlantic (we’ll skip Australia for now). I went through events like. Pole shift…..nope, only part of the northern hemisphere is affected and the equator seems status quo. A war…it doesn’t make sense that China and Russia remain as Status Quo, along with the Middle East…. Maybe Ice age? No, it isn’t affecting Japan or any of the Pacific Ocean countries similarly. After thinking through scenario after scenario, the only explanation is an event like a meteor striking the earth somewhere up near Iceland. Even as far away as Puerto Rico is, the Puerto Rican trench, running east and west of the islands north side, would amplify the wave immensely. U.S. coastal cities would be wiped off the map as well. I also added, in light blue, the areas of increased population, as though people are forced to migrate too… and it’s amazing. 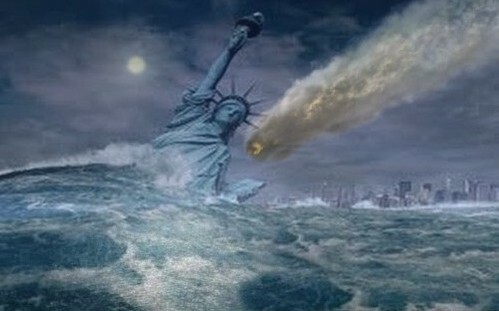 As Proud mentioned, a meteor strike in the Northern Atlantic ocean might not explain the massive population drop forecast for Australia and New Zealand of more than 10 million living there now who are not forecast to be living there in 2024 which makes us think that an 'event' geared towards Western civilization might be more likely but he does share with us these ideas. Now to Australia – if you look at the damage in Australia and New Zealand… along with no damage JUST NORTH of it, it would dictate a second strike near its southern coast…allowing Australia to protect everything JUST NORTH of it…..yet, you can see damage from Pacific waves arriving in south Korea etc. I noticed that many of the countries, that survive the massive depopulation, have HIGH cliffs along their coastlines … and some countries like Brazil, have high elevation for people to escape to, if given warning. It does APPEAR to be based on SOME KIND of data being given to them. Down right curious. God help us all. While we are not in the position at this moment to prove why Deagel's numbers show such a huge drop off for America and most of Western civilization, we welcome Deagel to contact us at [email protected] for an interview. We are not alone in wondering the real reasons why Deagel so strongly believes that there will be so many fewer people here in 2024 and why they expect our economy to be in such a mess by that time. Certainly if the numbers seen for America in the screenshot from Deagel below are correct, Americans deserve to know 'all hell is ahead' in our futures. And while the 'Watchmen' and 'preppers' have long seen the warning signs in the road ahead, most of the US population remains completely and totally clueless. In the 2nd video below we hear that both the Bible and Lakota Indian prophecy warn of a great stone cast into the sea and as we were recently told by NASA scientist Joseph Nuth at the Goddard Space flight center as shared in this Fox News story, the planet Earth is way overdue for an extinction level event. Warning us "it's just a matter of time before an asteroid brings large-scale devastation to the planet Earth and humans aren't prepared for it", do Deagel's massive population destruction numbers hint at an asteroid purposefully redirected into the Northern Atlantic Ocean to help wipe out Western civilization? While we'd hope that such evil would never exist on our planet Earth to do such a thing, we also know better. In the first video below our videographer breaks down for us another movie that's being pushed into our faces by the illuminati called 'The Thinning'. Showing a future America devoid of natural recources, who lives and who dies is dictated by a high school test and as our videographer shares, more predictive programming is being carried out before our eyes.